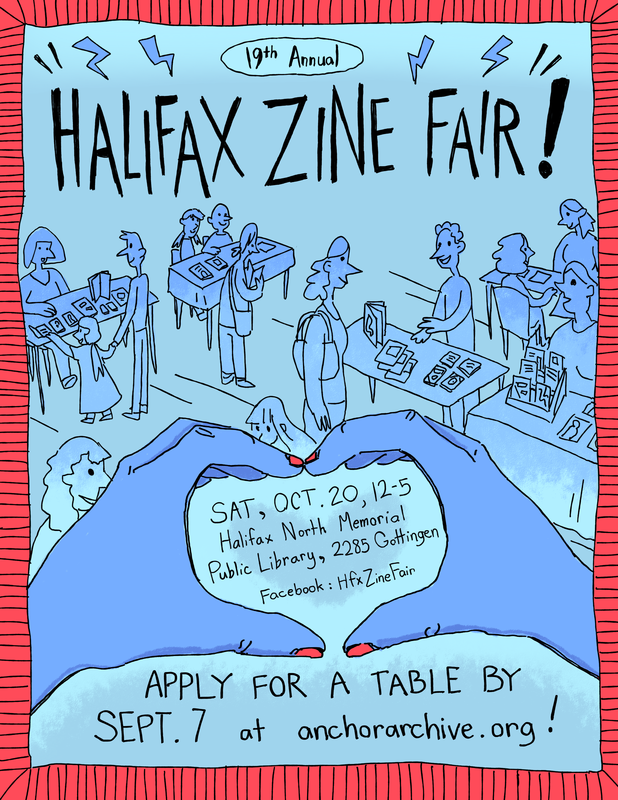 The Anchor Archive Zine Library is hosting the 19th annual Halifax Zine Fair on Saturday, October 20th at the Halifax North Memorial Public Library, in K'jipuktuk, Mi’kma’ki, in the unceded territory of the Mi’kmaq people. The Zine Fair brings independent zine-makers, zine distros, bookstores, small press publishers, comic artists, print-makers, authors, and musicians from all over Mi’kma’ki and beyond to sell, trade, and show their creations. The fee for a small table is $15 and for a large table $25 (or pay what you can). Table fees are paid at the event and help support the Anchor Archive Zine Library, a collectively-run, non-profit library that has a circulating collection of over 5000 zines and offers zine-making tools, resources, and programming to the community. The deadline to register for the zine fair has passed, but please fill out this form if you'd like to have a table and we'll see what we can do. Would you like to do a zine reading, performance, or presentation the night before the zine fair? If you're coming from out of town, will you need billeting? I would like to be considered for a travel stipend. Do you have any accessibility needs we can try to accommodate for? Would you like to help with organizing or promoting the zine fair? If so, what do you want to do?